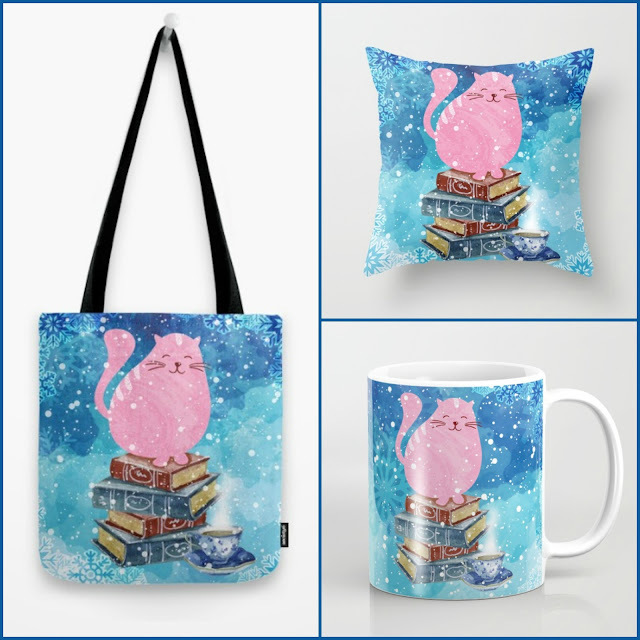 Enter this giveaway for a chance to win a very cute cat & books set with a tote bag, a mug and a pillow. Good luck! I love the colors of the prizes and my cats love this prize. I would love to see more teaching book for the young readers my little one loves to read and learning is the best. Perhaps book pairings...with different teas and chocolates and such! Maybe share some of the special offers you find online? Do you mean in the sense of bargain lists? Unfortunately Amazon rarely has bargains that are the same worldwide, which is such a pity. That's why we do try to find inexpensive books or freebies to review. A verity of kinds of books. I would like to see more book reviews of books written by Canadian authors. I think there is already a great balance! Love this cat print. It seems like most book blogs are YA-focused. I like fun YA fantasy books, but I'd like to see more literary books on blogs. Also, even self-consciously literary books from major publishers seem shaped, edited, styled, and marketed as "product" to serve certain publisher-perceived "niches." Just as every Chick-Lit book seems to follow a formula of start new bakery/open coastal inn/return home/move someplace quirky/meet old beau/meet new fireman-doctor-EMT worker-cad-saint/deal with old wounds/discover new love, all the literary books seem to fit various stock boxes--WW II, the Civil War, the Gilded Age, 1930s society, troubled family, etc. I want to learn about books that are both literary--with a sensitivity to language--but also quirky, funny, fantastical. Very few writers, even those who publish "prestige novels" from major publishers, seem to have much sensitivity to language. "He turned and said this, she looked at him and said this," etc. Blah, blah, blah. I know what you mean and as a former literature student I do miss that. I don't like expensive word throwing and dry stories, but do love a good literature story that's also entertaining. I at least found one for this year already. It releases on February 1st. I will keep looking as it's exactly what I thought when I started to make a general plan about what to review this year, that there should be some good, but also readable literature on the blog more. I'd love to discover bookish goodies eg from Etsy on your blog - they are the perfect addition to books after all! I don't really know what to suggest. Maybe do recipe book reviews? Or any Health related book reviews. I always love book reviews! I love the balance of your blog and can't think of anything you can do to make it better, thanks for all the fantastic reviews. I really want to win because the giveaway cat, book tote bag, mug and pillow is lovely design, simply elegant and proudly unique. Happy Holidays to all. Love books, and always interested in how other people relate to them. I enjoy finding out about the lives of authors so any more bios/interviews on the writers behind the books would be fab! I love the author interviews you post. I love the book reviews! I've found new authors here that I'd never heard of before! I enjoy author interviews. It's fascinating and fun to learn about them and their writing processes. I'd love to see more guest postings & the book reviews are super helpful! Thanks!! Love that bookish cat, Suze! 'Don't mend it if it isn't broken!' In other words, we all come to read your blog because it is fine as it is. Thank you so much, that comment really made my day :). So awesome! Please continue with your great reviews ;) not sure if you have one from all of you because you all love the book so much but that would be interesting to see differing views! I love bags and books! Adoro o passatempo e os prémios. Participo. I just found this blog but I really like it so far! I think I need to explore it a bit before saying anything more about it. Don't you dare go changing a thing girls. Where else could I get my daily dose of positivity? Actually I do agree with John Smith (above) regarding literature, the use of language etc. so am looking forward to the Feb. release you mentioned! Your blog has it all: reviews, giveaways. I'm a fan. More cats is good. Anything to do with cats and books is good. I really enjoy your reviews - maybe more of those!! i love the reviews and all the new boks, and the giveaway of course! I d like to see self help and books about your home. I love your blog as is! I have found so many great reads from you. Yes I would love to see fun party ideas. I really can't think of anything else I'd like to see in terms of books. How about sharing more about the two of you, like hobbies and such? I would like to see reviews of translations, if possible. I would love to see reviews for items you love and use! No, I love it as it is so much! I LOVE all the reviews! I have found some of my favorite authors and books here! Thank you for all you do! Some videos of reading a page of the book or interviews of authors will be a great addition. Maybe more in depth interviews with authors to get the nitty gritty- Ins and outs of their work in progress plus theirs daily lifes and how it affects their writing. Another thought how about allowing one reader to interview the author herself. Asking honest questions. Allow other readers to see how accessible and real the author are to each of us. I do like to see reviews of non-fiction books and biographies too. I would love to see reviews on young adult fiction as well. I like to read discussion posts, so it would be nce to read some on your blog. i think i'd like to see book event listings. I would like to see some middle grade fantasy or children's books for ages 6-10. I love the site just the way it is. Oh my i would love to win this!!!! I think it is perfect, why change it! It's great as it is . Thank you for the chance ! I like everything on the blog. Can't think of anything to change. What you have at the moment are already fabulous. Keep on the spirit! I love this site! It' s a paradise for book lovers. I 'd like to see more giveaways with "book items" like mugs, bags, bookmarks, tea, chocolates etc. IDK right now, I can't get over this kitty. I'm so in love!! Best deals on eReaders, I dont have one yet and hope to get one soon but I have a very limited income! It's an amazing blog already. I really have no suggestions. Keep up the good work! a few more cozy murder mystery book reviews. happy with it as it is! I don't really know what to suggest. How about including more non-fiction reviews? Besides giveaways, maybe some books to movies reviews. You already do so many book reviews. My favorite things to check out on blogs are book reviews and giveaways. Love what you guys are doing!! I am really happy with this site. I'd like to see movie reviews. I enjoy reading author interviews & I'd love to see more book related things that we can buy! I love your blog. You've brought a lot of great books to my attention and I love it! I think you guys have it pretty much covered! Can you please send me a pm as to where I might be able to purchase items such as the ones in your giveaway. Thanks so much.